The nine-piece collection will be sold exclusively at select Saks Fifth Avenue locations and online next spring. MILAN — Dean and Dan Caten are training for an alley-oop. The founders and creative directors of Dsquared2 have teamed with Chicago Bulls shooting guard Dwyane Wade on a capsule collection that will launch exclusively at select Saks Fifth Avenue locations and at saks.com next spring. The Dsquared2 for Dwyane Wade collection celebrates the relaxed elegance of the basketball player — who wore a custom-designed Dsquared2 tuxedo for his wedding in Miami in 2014 — combined with the brand’s signature aesthetic and fit. The collection will include nine pieces for both daytime and nightlife occasions. “After having known Dean and Dan for many years, with their innovative designs influencing my style choices, I am thrilled to partner with Dsquared2 on a collection for Saks Fifth Avenue that expresses our shared vision of fashion as a means of creative expression,” said Wade, who will collaborate with the brand on a second capsule debuting later this year. Among the key pieces included in the capsule are wool jogging pants matched with a poplin T-shirt decorated with a maxi “3,” Wade’s jersey number, which also appears as a washed patch on a denim shirt in which the back is printed with the name “Wade” in black. Outerwear options include a biker jacket combining leather with denim reflecting Dsquared2’s signature patchwork, as well as a sporty nylon bomber with an athletic appeal. A geometric symbol designed by Wade is printed on the back pocket of a pair of white narrow fitted jeans washed to obtain a 3-D effect. The Dsquared2 for Dwyane Wade collection also offers a quite eccentric, creative take on tailoring with a tuxedo showing a camouflage Lurex jacquard jacket featuring black satin lapels matched with stretch wool slim pants and a poplin shirt embellished with crystal touches. 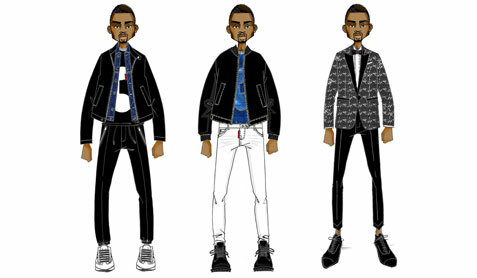 In the meantime, the Caten brothers are gearing up to unveil their fall men’s and women’s Dsquared2 collections, which will be presented with a single show to be held in Milan on Sunday. Asked about the main inspiration of the two collections, it’s “Canada, home sweet home,” exclaimed Dean Caten, noting that both the men’s and women’s fall lineups incorporate strong outdoor elements. Oversize silhouettes and buffalo plaid fabrics will also define the show, which will be enlightened by pops of color. Dsquared2, which kicked off an aggressive retail expansion strategy in 2015 leading to the openings of flagships in key locations such as New York, Miami and Los Angeles, as well as a second store in Paris, recently inaugurated a boutique in Amsterdam and is about to hit Las Vegas.